Looking for a small, stylish, well designed and fun to ride SUV, well the Mazda CX-3 is just for you. The CX-3 fits below the CX-5 in Mazda’s lineup of SUVs. Being a five-seater, it’s quite small as compared to a regular crossover SUV, and that is what makes it light and peppy to drive around. With a 2.0 liter four cylinder engine coupled with a six-speed automatic transmission pumping out 146 horse powers, it gets its zooming capabilities.At the same time, strategic weight reduction measures and a sports tuned suspension gives it much better handling and cornering capabilities than larger SUVs. The car has both two-wheel drive variant and a four wheel drive variant for excellent on-road performance as well as casual off roading. The interiors are equally well-designed and fitted with all the basic and modern amenities. 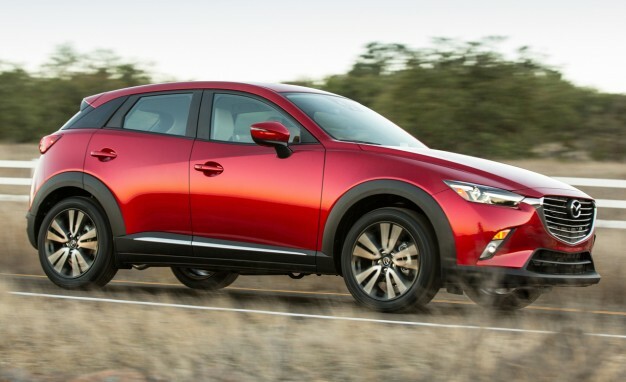 Mazda CX-3 looks a lot sportier and peppy as compared to other SUV siblings. It looks more like a sports car than a crossover SUV. It follows a unique design convention consisting of smooth curves, transitions, arches, and joints. This not only makes the car look modern and sportier. The interior of the car also translates the overall design conventions that are followed. The center control houses a 7-inch touch screen entertainment system along with Bluetooth, air conditioning, telescopic steering wheel, cruise control and keyless ignition. Owing to the fact that it houses a 2.0 liter inline four engine, the numbers are reflected in the mileage figures. With an overall mileage of 31 miles per gallon, it’s quite good as compared to its competitors. The major con that Mazda faces is because of its small form factor. Packing a four wheel drive system combined with its small crossover look results in a much lesser boot space. At just 13 cubic feet it is quite less than the space available in compact sedans. Also because of the swooping roof lines, the rear windows are a lot smaller which can render a bit of claustrophobia. The Mazda receives a solid 3.5 stars out of 5. If you are looking for something that’s good looking, performs well on and off the streets, as well as large enough to carry 4 to 5 passengers then definitely Mazda CX-3 is a car for you.